Fires are natural - most of the time (click on image for larger view). Using the word 'unnatural' is always risky, but here it is meant to convey control by humans - which in itself is 'natural', but introduces many variables not before seen in history. Unlike natural fires which are beneficial, unnatural forest fires often have the opposite effect - especially when used to clear land of trees to make way for agriculture or construction. Over time, the number of trees decreases while the number of humans increases. More humans require more agriculture which means more deforestation. Carbon dioxide is a major product of wood combustion. Looking at the above map, the produced amounts of this gas from fire can be seen over a thirteen year period from 1997-2010 (click on the image for a larger view). It's fairly obvious that fires tend to arise in the same places year after year. In most cases, the carbon dioxide produced is a result of naturally occurring fires as described above. However, in a few cases - particularly the Amazon Rainforest - much of this carbon output arises from unnatural fires. What is so special about the Amazon rainforest? For starters, it represents over half of the world's remaining rainforests. It has been around for over 50 million years during which time numerous animals and plants have evolved and thrived within its confines. One in ten known species (of both plants and animals) lives in this area, representing a mind-boggling array of biodiversity. In a universe where life is scarce (see previous article about finding Earth II), the Amazon is brilliant diamond to be admired and respected. Humans (nay, all animals) rely upon the rainforest as well. Not only does it produce oxygen, but it also consumes carbon dioxide - necessary for all breathing animals. NASA has estimated the number of trees world-wide at around 400 billion. The human population is nearly 7 billion which gives us around 57 trees per person. In the past, that ratio was much higher in favor of the trees. That being said, there are still enough trees to support the oxygen requirements for life as we know it presently, but the ratio is still going down. It should be noted that about half of the world's oxygen supply does not come from trees or plants, but from the phytoplankton in the world's oceans (which itself has changed, but that's another story for another time). That's a good thing, given the amount of deforestation which has occurred. Otherwise, we might already be able to notice tangible differences in our air. Brazil's GDP has gone up recently, perhaps reducing the need for deforestation. Since 1970, about 80% of the Amazon rainforest remains. In terms of actual forest loss, that equates to about 745,000 square kilometers - that's larger than the size of France! 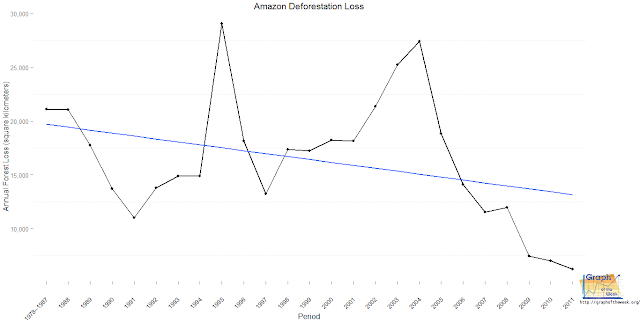 However, as the chart above shows, the rate of deforestation has been going down since 2004 due to a number of reasons. Hopefully this trend will continue - not only in the Amazon, but other forests as well. Fires are a naturally occurring phenomenon which are beneficial to the world's ecosystems. However, when fire is used to remove forests for agriculture or construction, what remains has a greater burden to support a larger population of humans. This harms our symbiotic relationship with the trees so this cannot continue indefinitely. Like any good relationship, we must respect and nurture our partners while they do the same for us. Perhaps the recent trend in the Amazon is an indication that we understand this. Short-term gain is not a bad thing, but if it means a long-term loss then it is surely the wrong path. 2) What is going on in the world's oceans in terms of oxygen production? 3) When will a 'breaking point' occur at which time resources cannot support future population levels? These graphs were generated using the 'ggplot2' and 'maps' packages within the R programming language. In the future, different plotting packages will begin to be seen here, including 3d plots and trellis plots. Stay tuned! I'm no hater of choropleth maps, but your map here highlights one of their weaknesses, namely mixing in political borders which gives undo visual prominence. In your map above, you graph the total grams of fire carbon emissions as a color filling the entirety of the country. This has a compounding effect that skews the data. Is the deep red an effect of the amount of carbon output or the size of the country? Since big countries have more trees to burn, they have more carbon output. And since they show up bigger on the map they are even more prominent. In short, not only is Brazil deep red, it's deep red and huge! Graphing by color the carbon output per square km (or per wooded square km if that exists) or graphing circles for the size of carbon output would be an improvement in my opinion and closer to what the data really show. Completely agree with you. The data that I was able to obtain listed the carbon output by country, so that's what I had to go with (http://www.globalfiredata.org/). Now, on *their* site (the Global Fire Data site), it shows what you are looking for, but all of the FTP links to that sort of data were broken (I tried every one, multiple times, multiple ways). And to answer your question: the deeper the red, the more carbon output by amount contained within the country's borders.